BAE Systems is the world’s second largest arms producer. It makes fighter aircraft, warships, tanks, armoured vehicles, artillery systems, missiles, munitions and much more. In 2008, company sales exceeded £18.5 billion, with about 95 per cent of these being military. BAE has been under investigation in numerous countries. In December 2006, the Serious Fraud Office (SFO) dropped its corruption investigation into BAE’s Saudi arms deals following pressure from BAE and the Saudi regime. However, investigations into the Saudi deals continued in both the US and Switzerland. 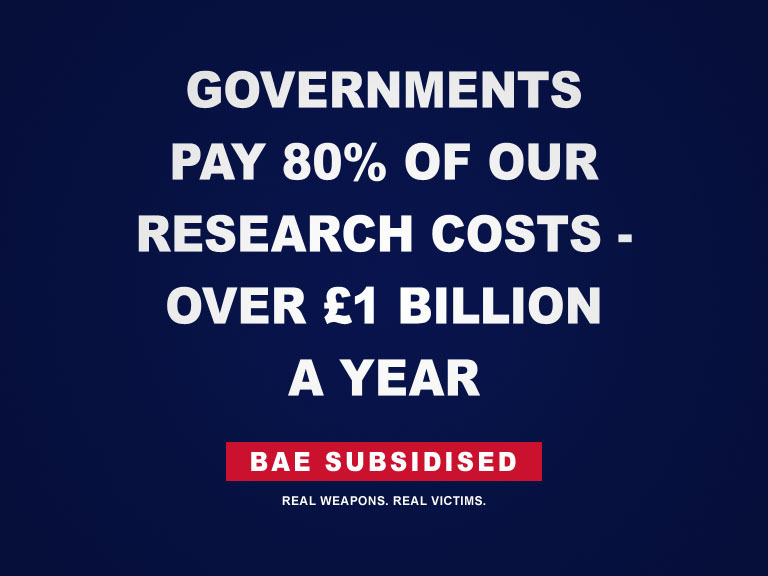 In addition, the SFO and agencies in other countries continued to investigate many other BAE deals, including sales to Austria, the Czech Republic, Hungary, South Africa and Tanzania. On 1 October 2009, the SFO stated that it intended “to seek the Attorney General’s consent to prosecute BAE Systems for offences relating to overseas corruption”, and on 29 January 2010 the SFO charged a former BAE agent with making illegal payments. However, just a week later the SFO settled with BAE Systems. CAAT and The Corner House were shocked and angered by the plea bargain relating to only the smallest deal and began a legal challenge over the decision. On 2 March they were granted an injunction prohibiting the Director of the SFO from taking any further steps in its plea bargain settlement with BAE Systems. BAE’s arms are sold indiscriminately around the world. It has military customers in over 100 countries. Its recent focus has been on increasing sales to the US, specifically targeting equipment for the conflicts in Afghanistan and Iraq, and supplying Eurofighters to the Saudi Arabia regime. Other export deals include sub-systems for Israeli F-16 fighter aircraft and sales to both India and Pakistan. and India likely to become a seventh. BAE is unlikely to prioritise UK interests. As its Annual Report states, its strategy is “to deliver sustainable growth in shareholder value”.